So, those twelve seconds of damp, awesomeness represent pretty much half a day’s work. Fortunately for me, most of the art for that shot had already been prepared for the teaser a few weeks ago, so all I really had to do was create a thunder god and whip up a storm. Easy stuff, eh? Anyway, I thought it would be interesting to do a short post on the technical malarkey behind creating the Thunder God in that scene. I’m primarily working with four applications: Sketchbook Pro, Adobe Photoshop, Adobe Flash and Sony Vegas. Most of the individual pieces of art are knocked together with Sketchbook Pro on my iPad. 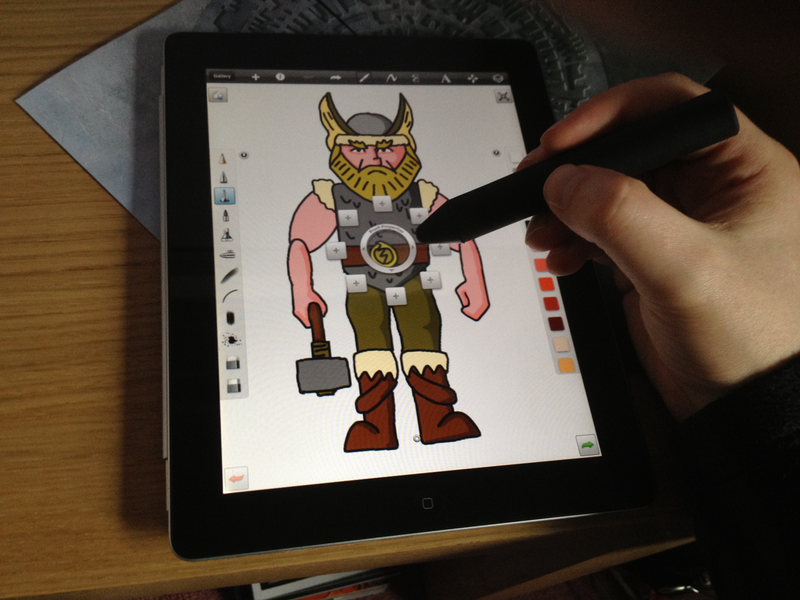 Due to my fat sausage fingers, I have to use a stylus. 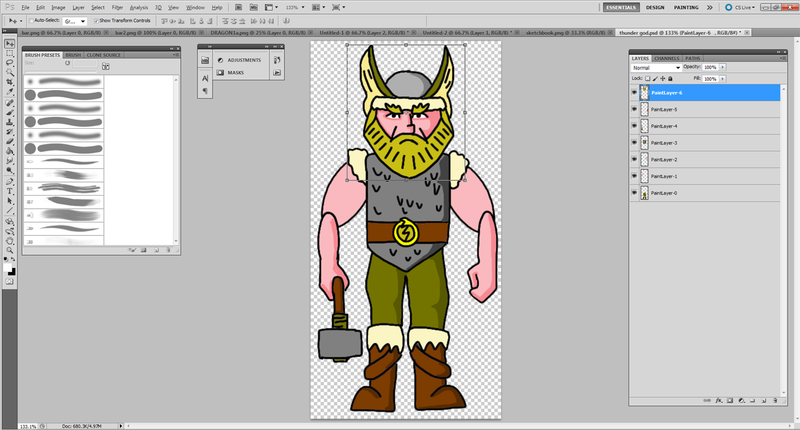 Each part of the Thunder God has been drawn on a different layer – his head, torso, upper and forearms etc, so that they can be animated independently later. I do three versions – one full length frontal body, one from the sige and then a final, more detailed version of his head and shoulders, for those close up shots. Once I’m happy with the designs, I send them off to my desktop computer via the magical medium of e-mail! Step 2: We’re Splitting Up. Sketchbook is pretty good for the actual drawing, but it has quite a few limitations. I get round these, by finishing up the design work in Photoshop. Once I’ve imported it into Photoshop, I do any last bits of tidying up, but the main thing I need to do is separate each layer into a nice neat, trimmed .png file so that they can be imported into Flash later and animated independently. So I hide everything but the body part I’m interested in (yeah, yeah – I know how your minds work…), use the ‘trim’ tool and then save it down. Once I’ve done this with all of the Thunder God’s bits and pieces, I’m ready for the next step. Here’s where it all starts to get complicated. I’ve imported all of the Thunder God’s bits in Flash, along with all of the other elements that make up the scene. All of these bits have to then be converted into symbols and placed in the workspace. Each object has it’s own layer and, as you might expect, things that appear at the back go on the bottom layer and the closer to the front they get, the higher up the timeline they go.I use Adobe Flash to create each of the separate shots used in the final video. For anyone who’s never seen this process before, each row of the timeline represents a layer. 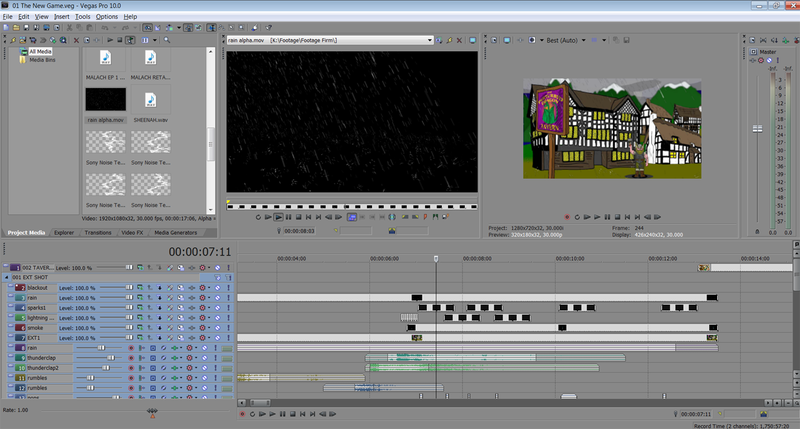 and each frame of the animation is represented along the top of the bottom section from left to right. Fortunately, I don’t have to animate each individual frame of the video. Flash allow me to set the starting and ending point of each individual movement and fills in the bits in between for me. 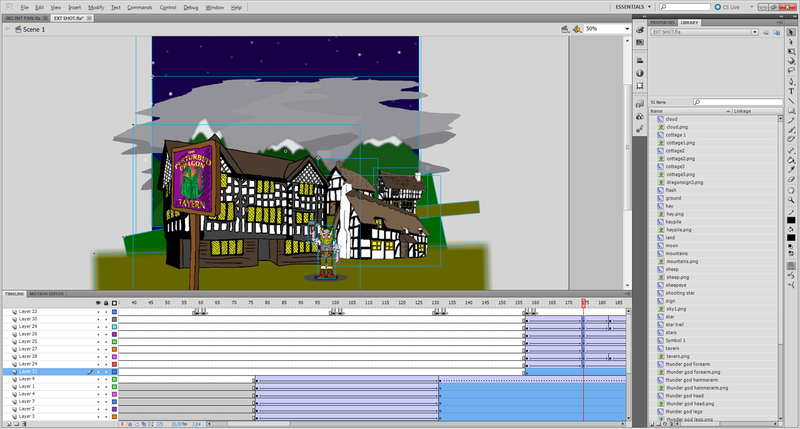 On this screen shot, the long blue bits in the middle of the timeline represent the camera panning down form the sky to the Tavern. In actual fact, the ‘camera’ stays still and the Tavern and the hills and all the other bits and pieces move up into shot! Over toward the right you can see a set of movements which start with the Thunder God’s appearance and the movement of his arms. So, once I’m happy with the animation, I export the animation as a video file and move onto the next step! The final step is to import the animated clip into Sony Vegas, my trusty video editing application, and add a whole bunch of special effects to it. You can see from this picture that the Vegas workspace is quite similar to the Flash one. Although it’s still all timelines and layers, though, they’re used for pretty different things. It was important to me that the Thunder God arrives in a massive, over the top lightning strike. So I created the lightning strike in Vegas using the media generator function. That took a lot of fiddling. Then I added a bit of smoke from the crater that was created by the strike and some little sparkly bits. These were bits of stock footage that I overlaid on top of the imported animation. Thunderstorms without rain are weird. At least in the UK. So I also plastered on a bit of rainy stock footage. And finally, courtesy of the good folks who contribute to Freesounds, I layered on some sound effects – rain, some rumbling thunder and a nice big thunder-clap. Oh, and some pops, to go with the sparkly bits. I did those with my mouth. And my finger. That’s pretty much it. About four or five hours end to end. For twelve seconds of footage.